„Dancing out of the space of the heart ®"
is conceptualized to take place on weekends. You can take part on the premises that you have a finished education in another profession, are 25 years old and took part in one weekend of introduction into the technique which serves the process of mutual getting to know each other and decision making. After this the final registration can take place with a curriculum vitae and outline of the motivation for the training group. Dancers, musicians, teachers, medical doctors, nurses, psychologists and other people who work in social fields. The training will take place in Bremen and will take 3 years. In each year there will be 4 week-ends. The intensive weeks will take place in the fall. Working hours: Friday: 18.30-20.30 h; Saturday: 10-13h and 15-17.30h; Sunday: 9 –14h.The trainees have to take part in at least 24 hours of dance-therapy on a one to one basis. You can sleep at the Tanzhalle without further costs. Per training weekend: € 265,-; reduction is possible for people in financial need; for the intensive (Monday: 10a.m. to Friday: 2.p.m. h) € 555 training-fee plus ca. 65 € for catering and rooms per day. The sum is € 4290,- / (3550,- reduced prize) in total (plus catering and rooms during the intensive). The costs are paid on a monthly basis, which means a rate of € 126,- (105,-) for 34 months. If you cannot take part in one weekend the costs are still to be paid. I use sacred dances ( alignment with the vertical and horizontal planes, opening movements of different qualities) and elements of dance therapy (active imagination in dance, promotion of the expression of feelings in the body, working with certain movement archetypes from different cultural backgrounds). Dance as a healing art which embodies the 4 dimensions of the human movement experience (physical, emotional, mental and spiritual) in a holistic way. “Dancing out of the space of the heart ® is an integral therapeutic approach to transformation. One key point of the work is to learn to deal freely with space symbols (circle, triangle, labyrinth, square, spiral etc.) which I developed myself during my dance experiences. The connection between space and ritual in dance is very important as it allows us to come closer to the questions of our personal existence in the body. Here the personal and transpersonal sphere are linked together. In the process of the dance we generate creativity in an individual and a collective way. This is based in the belief that even nowadays dance still has a great transforming quality and that we can find answers in the dance to our everyday questions as well as to our deep longing for God. We can very easily experience the spiritual side of dance in nature. Therefore we will often dance in nature and reflect on this. Developing a creative approach to dance as a means to express the SACRED and the therefore needed consciousness of the body. Learning and creating sacred circle dances. Dealing freely with elements of the dance-therapy. Group-building. Learning to work intuitively with music. 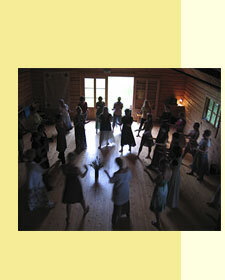 Getting to know the theoretical background of dance-therapy and ritual dance forms. The theoretical background of this training „Dancing out of the space of the heat ® is the analytical psychology of C.G. Jung especially the knowledge of the archetypes, integration of the polarities and working with the unconscious through active imagination in dance and movement. In the area of sacred dance I use the approach developed by Bernhard Wosien and Maria-Gabriele Wosien and their theoretical implications. The concepts of Anna Halprin and Kaye Hoffman inspired my mental approach to dance. The second year: creating circle dances and the dance notation. Working creatively with music and groups. Putting the learned experiences into action in ones own professional field. ; how to access the spiritual dimension in dance. As dance always is flexible it can happen that theme themes are worked on in a different order. During the training weekends we will also work with going into Silence. Meditation and dance are enhanced by each other. At the end of the training a certificate will be handed out which will contain the contents of the training on the premise that one took part in the training, created three circle dances and wrote a reflection on one work with an own group. Cornelia Freise, born in 1957, living in Bremen in northern Germany. Graduation in law, after a major shift in my life I have begun to teach sacred dance in 1986. Learning with different dance teachers. Training in Biodanza – Dance of Life 1988 –1990. Since 1992 I have worked free lance as a dance therapist (HPG). In 1996 foundation of "The dancing wild sow – Institute for transformation through dance, meditative dancing and dance therapy" in Bremen which makes available 2-year-dance-trainings „Dancing out of the space of the heart“ for people from different professional backgrounds. International workshops in California, Singapore and Estonia. Since 1985 I have followed the mystical path of the Golden Sufis which inspires and carries my work.